About a week ago, I cast on Peapod (and then had to re-cast it ten minutes later when I completely misread the pattern because my stepkids were watching Fiddler on the Roof and Matchmaker, Matchmaker was burning up all my brain cells). I have had the sense previously that Kate Gilbert deliberately makes her patterns more complicated than they really are. Four different charts for one simple baby sweater? Several stitch holders? And all the flipping back and forth from page to page? The woman is messing with me. But once I escaped from the horrors of Fiddler (I come by this revulsion honestly--I was Shprintze when I was thirteen. I've heard Sunrise, Sunset as many times as the sun has risen. And set.) I settled into Kate Gilbert's mind quite comfortably, and the pattern flowed easily. 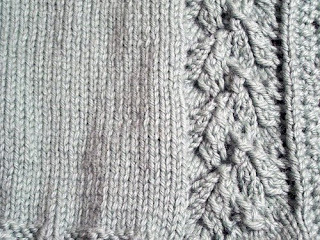 There's enough stockinette that I can watch most other (sane) movies, and I can knit at work, but the leaf panel provides just enough momentary excitement that I still want to knit the thing. And the yarn certainly helps. Knitpicks Merino Style is probably not the most practical of choices given its handwash-only aspects, but the tight weave is producing the softest baby gift I have ever made. I have used Merino Style before, but on much larger needles (and really one of the uglier things I've ever made. Old man vests are just never attractive) and it just didn't seem quite as soft as I knew it could. And the yarn is asparagus-colored. Not pale seafoam, as the picture would indicate. My camera hates me. The pea pod is so cute. If only babies didn't grow out of these beautiful time-consuming hand-knitted pieces of art so quickly.